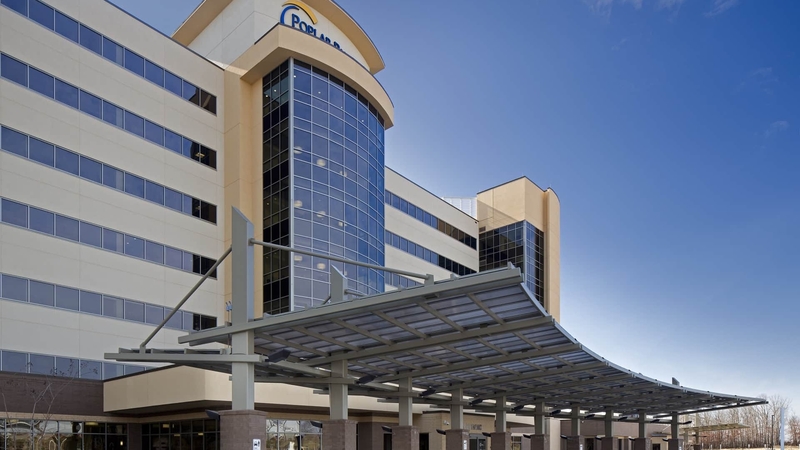 Poplar Bluff Regional Medical Center is a new state-of-the-art, 250-bed replacement facility situated on a 64-acre campus located in southeastern Missouri. The medical center is eight stories, totaling 420,000 square feet. The facility contains eleven operating rooms, including one hybrid operating suite. The natural topography of the site allowed for support services to be located on the ground floor providing convenient access to Material Management, Pharmacy, Lab and Dietary Services. The Emergency Department, Outpatient Surgery, Surgical Services, PACU, and Imaging are located on the first floor. A seven-story patient tower houses a second floor Intensive Care Unit, a third floor Women’s Center, and private patient rooms on the upper floors. Total time for design and construction was only 18 months, half the time typically needed for a project of this size and nature. A departmental configuration that allowed for horizontal and vertical adjacencies to be optimized, facilitating ease of patient transport, service and operation. A connected medical office building that contains administrative and business functions for the hospital as well as medical offices for physicians affiliated with the hospital.